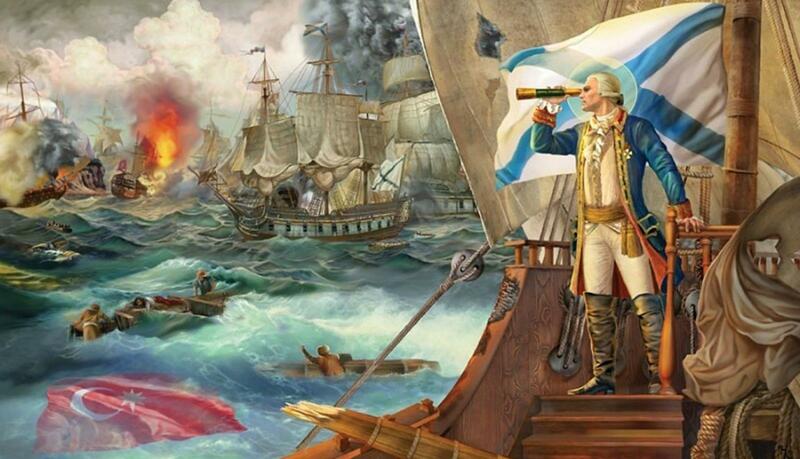 Weigh anchor, and raise the Saint Andrew’s Cross of the Russian Fleet, it’s time to sail back into history, with this latest Russian Hero’s tale. Amongst his feats, this Hero can boast over 40 battles without tasting defeat; this is Fyodor Ushakov, Admiral of the Russian Fleet. Admiral Saint Ushakov, was a contemporary of Admiral Lord Nelson, however unlike his British counterpart, Ushakov was never defeated in over 40 battles, oh...and did I mention he once inflicted 2000 casualties without taking more than thirty? His talent was so great that the famous British Vice-Admiral was to be put under his command during the joint siege at Malta, to the ire of Nelson, who later sabotaged the alliance. 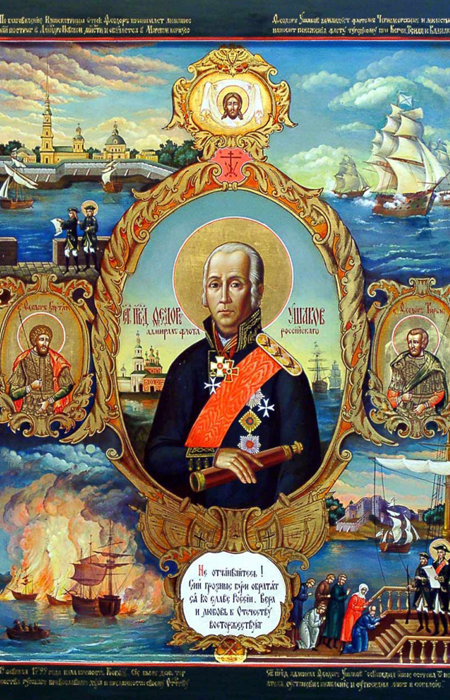 Ushakov was canonized not for his military heroism, that alone does not qualify for canonization—it was instead, how he preserved the spirit of a true Christian in the horrible conditions of battle, always risking and ready to sacrifice his life those under his command. While we will discuss his faith, let us first establish that Saints were not magical superhumans without sin, they were normal people like you or I, who obtained Holiness and oneness with God, and to understand them, we must look at the normal aspects of their life. Learning humility form his uncle, a monk, this young nobleman spent much time with the common folk, giving him a strength and understanding of the stark realities of the world, unlike sheltered Western aristocrats, who (literally and legally), purchased their military ranks. By age 14 he was fully capable of hunting Russian bears, and he entered the Naval College two years later ,graduating as a midshipman in 1765. Ushakov learned one of the most important military rules of all - how to be flexible. He took this flexibility with him the rest of his life, fluid as the waves of the sea and strong like the first of a tsunami. He was the Champion of the Black Sea. These beautiful pink lakes in Crimea are not far from the site of some of his greatest battles. When Russia liberated what is now Southern Ukraine from the Ottoman-Turkish rule, he guarded the coasts of what was then “New Russia”. 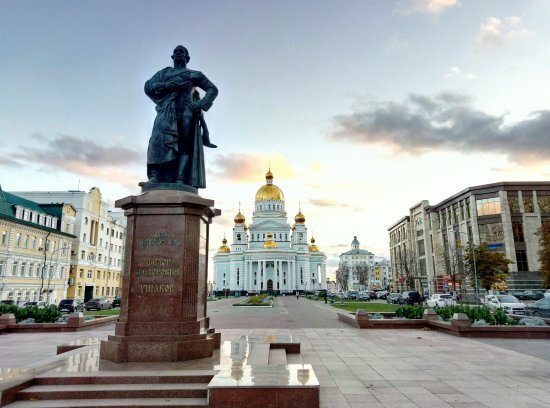 One of his most lasting and peaceful contributions to Russian and Ukrainian history was when he oversaw the construction of two significant naval bases at Kherson the Old and Kherson the New. Ancient Kherson was a Greek colony, the northernmost metropolis of the Eastern Roman Empire, and the site of the Baptism of Saint Vladimir of Kiev - the Baptiser of All Russia. Saint Vladimir's Church at Chersonesus, Crimea featuring Greek ruins. Kherson is derived from the Greek word for Peninsula, as in the Crimean Peninsula. We know Old Kherson by a different name: the Hero-City of Sevastopol, the greatest city in Crimea. 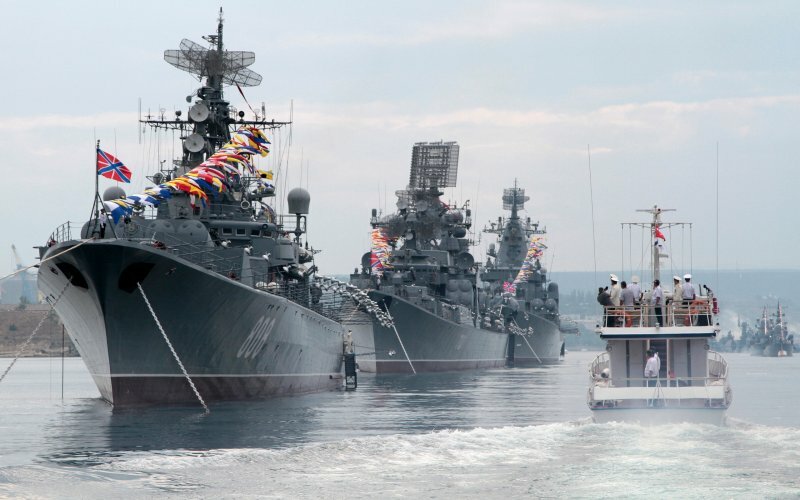 Legendary for its battles, Sevastopol is Russia’s most precious warm water port. Ushakov built the first naval base in Sevastopol, which remains to this day crucial to Russia’s national defence. The Russian Fleet on Parade at Sevastopol, note that the flag which resembles the British Union jack is actually a Russian ensign. Since its founding by Potemkin on Catherine the Great’s orders in 1778, modern Kherson is Ukraine’s second most famous port after Odessa, and located at the mouth of the legendary river Dnipro (the river where all of Russia was baptized upstream in 988) north of Sevastopol where Crimea meets Ukraine. There Ushakov build the famous docks. It was in this Black Sea, where Ushakov became a legend, the dread of the Turkish navy who called him “Ushak-Pasha”. Perhaps an insult or a title of infamy and dread, it was one that carried a modicum of respect: “Pasha” is the highest Turkish honorific, similar to Lord in English, Vladica in Slavonic, or Pan in Ukrainian and Polish. 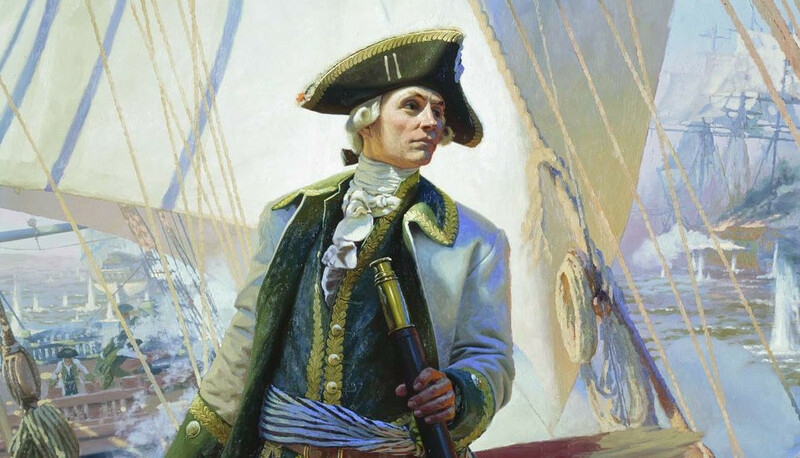 Ushakov distinguished himself as a brave commander during the Russo-Turkish War in 1788. At the Battle of Fidonisi Island, his fleet supported the infantry of the legendary Aleksandr Suvorov, himself the undefeated victor of over 60 battles. Second-in-Command Ushakov saw the Turks outnumbered the Russians by almost three to one. Realizing this was a fair fight, he did what any Slav would do and charge directly at the Turkish flagship. In all seriousness, he made a brilliant but risky decision. He knew his troops were better trained and equipped than the Turks, but their numerical advantage could spell the end for him in a battle of attrition, so he decided to leverage his strength while he had it to even the odds swiftly. Seizing the initiative, he charged the enemy flagship. He awestruck the Turks, winning the day not only for the navy, but paving the way for Suvorov and Potemkin to drive the Turks from Ochakov fortress. At the decisive Battle of Kurch, now Rear-Admiral Ushakov found himself yet again at a numerical disadvantage (come to think of it, I believe during every battle he fought he was outnumbered), the result? He took less than 30 casualties and lost no ships while the Turks lost five ships, hundreds of men, and had their admiral and captains captured. At Tendra he continued this trend, but inflicted thousands of casualties on the Turks, and at Cape Kaliakra, he won the Naval War. 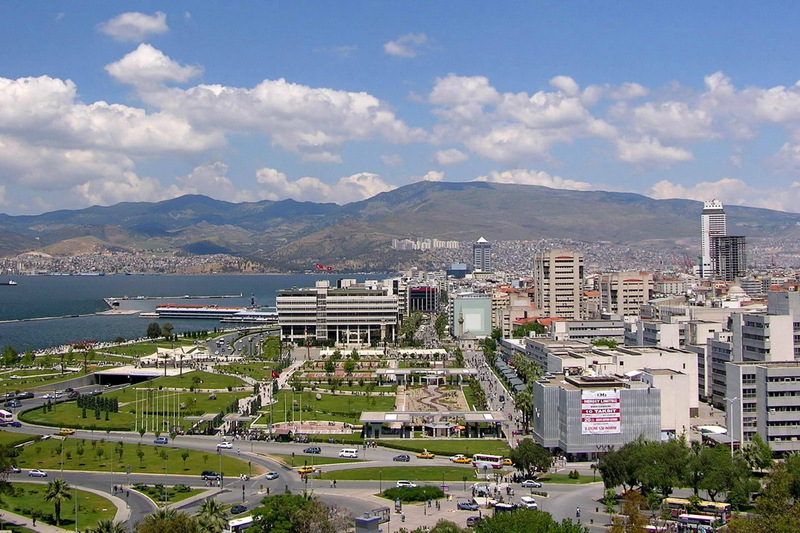 He was soon promoted to Vice-Admiral and given command of the Black Sea fleet. It’s remarkable his life is not known in the West, and the Russian Navy is thought of as insignificant. 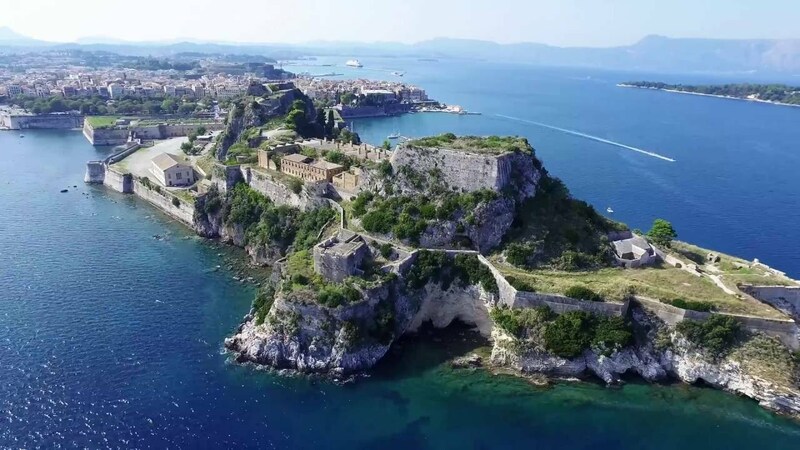 Ushakov had feats even Admiral Nelson could not match, having captured the unconquerable fortress of Corfu, Greece, from Napoleon in three months, whereas Nelson spent a year besieging Malta. The power of Orthodox culture aided him at Corfu, as Orthodox Greeks fought on land with their Russian brothers. Orthodox Greek natives welcomed Ushakov with a triumph. He ordered a thanksgiving service in gratitude to the Lord for saving his people. On Easter, 1799, he led a cross procession with the relics of St. Spyridon Trimifuntsky, a beloved saint to Greeks and Russians. “Here, on the islands, the God-loving admiral manifested yet another of his God-given talents: that of statesman and public figure. He not only ensured “peace and order" for the Greeks, but gave them one of the most democratic for that time constitutions, setting up the "Republic of the Seven Islands," opening an episcopal faculty on Corfu and inviting an Orthodox bishop, which they had not had since the sixteenth century. Ushakov earned his promotion to [full] Admiral for his heroism at Corfu. He, was later sent to assist the famous Vice-Admiral Horatio Nelson (whom he technically outranked), though his English colleague reacted to the idea of cooperating with a Russian equal quite negatively, and reacted shamefully. After Napolean was finally defeated, Nelson offered the French garrison terms of surrender so amicable, it could be mistaken for a truce. They would be ferried back by British ships, permitted to bear arms, and, most ridiculous of all, not even forbidden from “waging war”. So great was Nelson’s spite at the thought of working with Ushakov, and moreover, he so badly wanted to keep the Russian Admiral from parading in French-controlled Rome and receiving the praise he deserved. Ushakov considered this treason, and in return, paraded his troops through Rome, even though the French had already left. 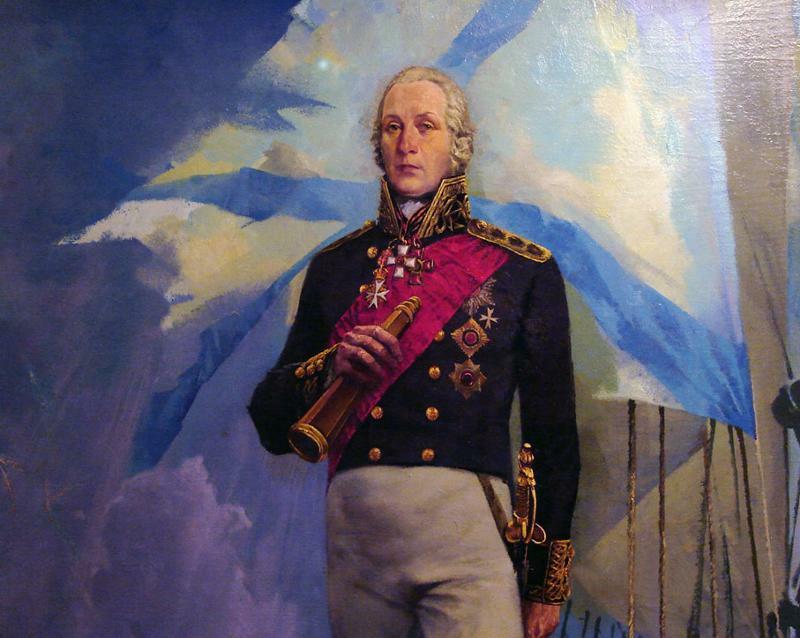 Ushakov behind the Saint Andrews Flag (a white flag with a blue x), the standard ensign of the Russian Navy. The Russian Navy also uses another flag which resembles the British union jack. Though his military carrier was the thing of song and legend, he fell out of political favour, and was eventually recalled to Russia. To read more about his military carrier, see here. Finishing his service honourably, he withdrew to Sanaksary Monastery, 500 kilometres east of Moscow, never to fight again. He struggled in prayer for the rest of his life, praying for every comrade, and even those wanderers he met by chance. He spent his final years thusly: First in prayer, which lead to peace, which lead to mercy in the Kingdom of Heaven. "You knew him as a great naval commander, we knew him for his outstanding charity to others." And thus passed into legend the life of Admiral Fyodor Ushakov, Patron Saint of the Russian Navy. Which Russian Hero would you like me to write about next? 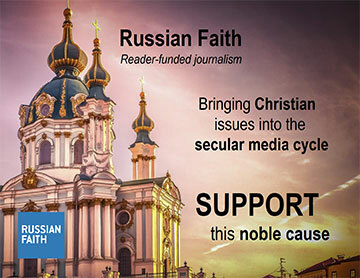 These articles are part of the series ‘Russian Christian Military Heroes’, which illustrates the close interrelationship of the church, state, and military in Russian history. As the author, I would like YOUR feedback. Let me know which of these Russian Heroes you would like me to write about next. If you have your own suggestion, let me know in the comment section down below!